The valiant and speedy resuscitation of the Sindhi community, post an enormously traumatic upheaval from their homes, is indeed emblematic of the dogged Sindhi fortitude. But all this at the cost of an allegation that the transitional baton of the rich Sindhi language, its vast history and its glorious culture was not gathered well by the subsequent and younger generation of the Sindhi community. An allegation, partly and justifiably blameworthy, but also partly caused by helpless preoccupation with the task of survival and rebuild. A deprived felling for an accessible homeland, the opportunity to stay back at scattered locations across the globe and the inconsistent and disrupted links with friends, relatives and erstwhile neighbours have shriveled the urge to reconnect and revisit their past and exhume the depths of their tradition. Many noble efforts to initiate and steer the process of establishing the Sindhi bonds have slowly, but with unflinching perseverance, made muted progress. They are not gladdened with the advent of technological media for amplifying their gentle voices. The revival of the Sindhi language and preservation of its magnificent heritage needed such strong and strapping reinforcements. That is why we created Sindhishaan. As a step towards demonstrating our intentions to contribute our might to the Sindhi reunion, we have, among other measures, launched the Sindhishaan publication. Our website, Sindhishaan.com, hopes to serve as an archival repository of well-researched and studied Sindhi literary works, which would augur well for the education of the younger members of the Sindhi community. Our intentions to explore television as an additionally effective medium to spread the message of the deserving Sindhi glory will only hasten the progression of a long over-due reunification. I dedicate Sindhishaan as a loving tribute to my grandfather, Late Principal N. B. Butani, who was very close to me. The inspiration behind the Sindhishaan enterprise stems from the long hours of his patient answers to my innocent questions, on subjects as varied as mathematics, physics, religion and philosophy. I fondly cherish those memories. Lastly, I congratulate my mischievous, yet, dedicated team of youngsters, who have tirelessly worked on creating Sindhishaan. 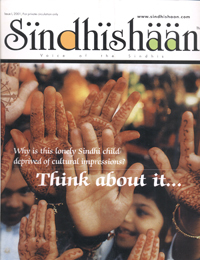 Together, we hope that you can enjoy reading Sindhishaan.